Originally published on the EIA website. Technology improvements for general service lighting, driven by federal efficiency standards, are leading to increased reliability and bulb life. As efficiency increases, residential electricity consumption for lighting declines over time. Although the initial purchase price is higher for more efficient technologies than for traditional bulbs, significant savings are achieved over the life of the bulb (also called a lamp). Lighting standards mandated by the Energy Independence and Security Act of 2007 affect general service lighting, the bulbs most commonly used for residential lighting. At the beginning of 2014, these standards required the production of higher-efficiency alternatives to traditional 40- to 60-Watt-equivalent incandescent lamps, which follow prior standards for 75-Watt and 100-Watt lamps. Between now and 2020, halogen incandescent lamps will be able to comply with applicable standards for general service lighting—a standard that traditional incandescent lamps cannot meet. An additional round of standards taking effect in 2020 will likely be too stringent for halogen incandescent lamps to meet, and major manufacturers have already focused development on more-efficient technologies. The efficiency (also called efficacy—the light output per unit of energy consumed) of incandescent lamps has increased only moderately since the introduction of the first commercially available incandescent lamps more than a century ago. Typical 60-Watt incandescent lamps produce only 16 lumens of light output per Watt with useful lifetimes of 1,000 hours on average, while a comparable halogen incandescent lamp may produce closer to 20 lumens per Watt. An equivalent compact fluorescent lamp (CFL) provides about 67 lumens per Watt and lasts 10 times as long. Solid-state light-emitting diode (LED) lamps are even more efficient—currently producing around 83 lumens per Watt—yet are rated to last more than 30 times as long as a comparable incandescent lamp. LED lighting technologies have been advancing rapidly with projections for further improvements, resulting in lower cost, increased reliability, and reduced energy consumption. 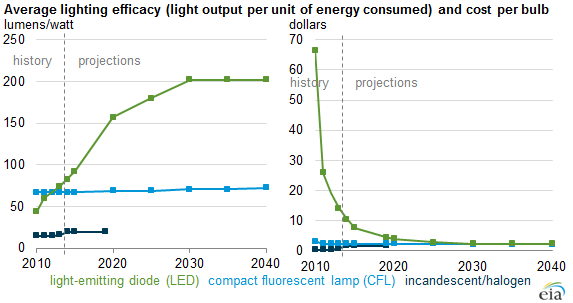 By 2020, EIA projects LEDs to produce more than 150 lumens per Watt. Decreasing prices for more-efficient lighting technologies, aided by state and local incentives and the new standards, are leading to increases in the average efficiency of installed lighting equipment over time. Improvements in bulb life mean consumers need to replace them less frequently, reducing projected purchases over the forecast horizon.